We as humans seem wired to want to pass things on to the next generation. We tell our children about our family heritage. We save heirlooms to hand down. We hope our children remember all the things we tried to teach them. And sometimes they even learn things we unintentionally model. I did not learn to knit or weave or sew from my Mom. She was a busy farm wife, mother, and freelance writer without much leisure time. But I saw that she sewed, she knit, she wove when something was needed, and I wanted “to do that too.” However, I learned to knit and sew and weave in 4-H and later in school. As a young mother myself, I wanted my children to know how to work with their hands. I wanted to share with them the pleasure of making something themselves. But I also did not want to force them. I did not want to make it a dreaded project. So I crafted around them, asked them from time to time if they wanted to try, and if they showed interest, I showed them. Now I wish I had been more tenacious. None of my four has taken up knitting needles, shuttle, or fiber. That may soon change. My daughter’s family just left after a week’s visit. In between trips to parks and reading stories, one granddaughter asked to learn how to knit. So I picked out some bright green yarn from the stash, a pair of easy-to-handle needles and off we went. She stuck to it and today before they left, she cast off a nice little sample piece. 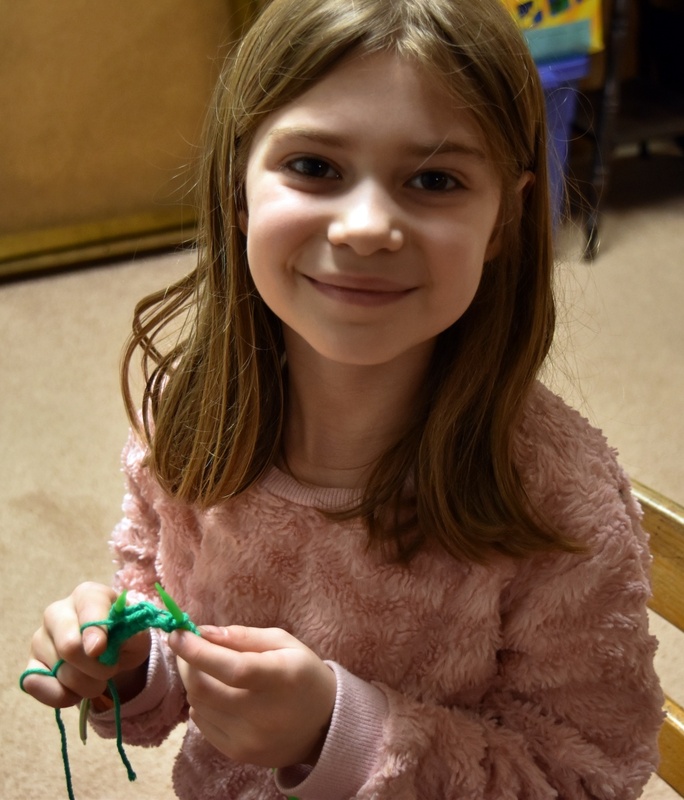 I did warn my daughter: now that her daughter is learning to knit, she, too, will have to learn so that she can help her daughter on this adventure. She smiled and nodded. 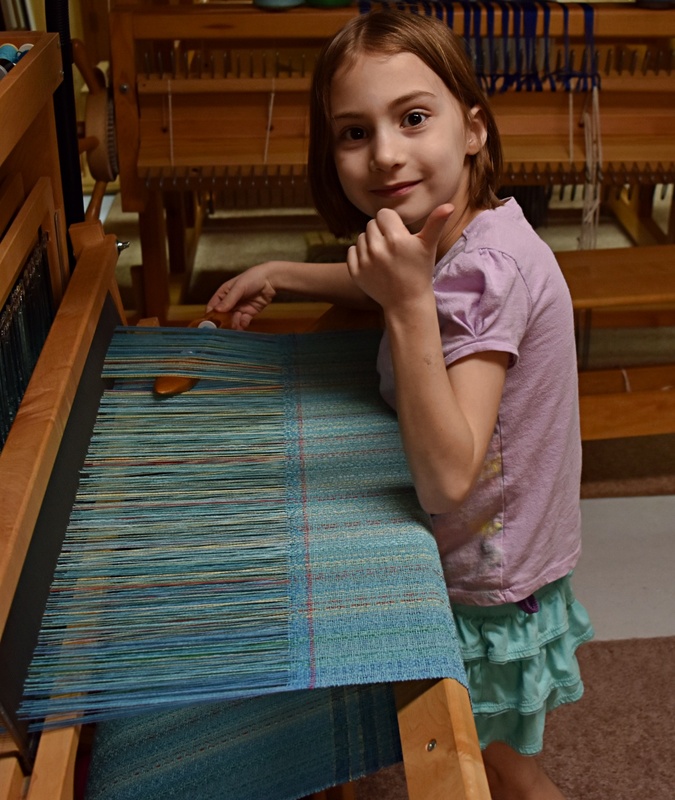 Not to be left out, another granddaughter asked how to weave. I have a towel warp on the loom with a bit of warp at the end. So I showed her how to move the treadles and how to throw the shuttle. She wove through one sequence of the twill pattern, then she skipped off to another game. Shorter attention span on that one! Someday, she may try it again. At least she knows whom to ask. Not every child or grandchild will be interested in fiber arts, but every one we teach will in turn pass along the skills in their own children. It’s been going on for generations. What To Do With Loom Waste? After I took my blanket off the loom, I was left with a familiar dilemma—what do I do about all that loom waste—thrums in weaving parlance. Loom waste is the warp yarn left when you can’t get weave any further. Most of the time, it’s about 36” that is either cut off and thrown away or tied on to the next warp. On my Glimakras, it can be as much as 42” depending on the draft. For a wide warp, that’s a lot of yarn. I left the warp knotted on the loom after I cut off the blanket. I just couldn’t bear to throw it away, knowing how precious good wool is. Yet what could I do with it? Back in 2014, I used thrums for mug rugs in an overshot weave but I don’t need any wool mug rugs right now. A couple years ago at a Midwest Weavers Conference, I took a class by Robyn Spaedy on making jewelry with thrums. She creatively wound precious yarns around pipe cleaners and twisted them into curious shapes to make whimsical pendants, earrings, and bracelets — an inspired used for sparkly, fun yarns, but these muted colors of wool wouldn’t make much of a statement. So the thrums stayed on the loom. At the same time, I’ve been pondering what I can weave for our annual guild challenge. The past few years, the challenge has revolved around the color of the year. This past October, we met at the University of Missouri Museum of Art and Archeology. We were challenged to use something in the exhibits to inspire a finished product. “Lallah Rookh” by Francis John Wyburd is filled with elements that can be translated to the loom, from the bed covering to the drapery, and even the women’s clothing! As I walked past the loom with the wool this week, it occurred to me that this wool could make great cushion fabric for my loom bench. And the bed covering in “Lallah Rookh” looks like rosepath boundweave! At last, inspiration! 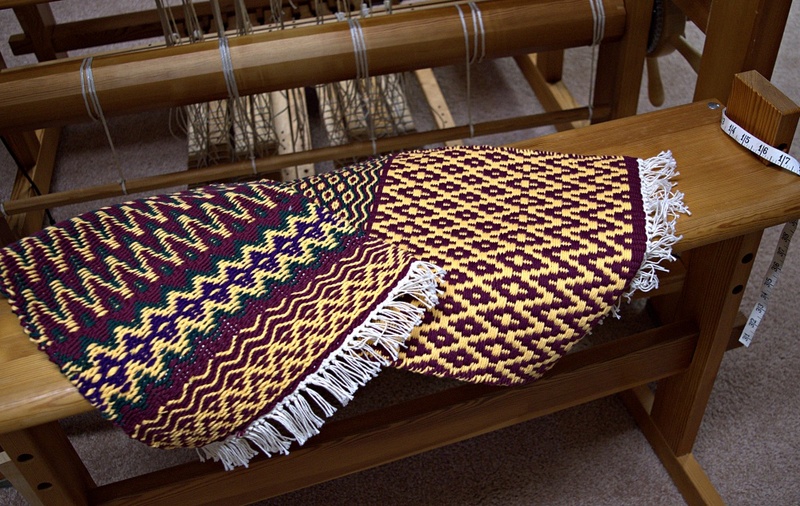 In boundweave, the weft covers the warp entirely. It makes good sturdy rugs with striking figures if more than a couple colors are used. 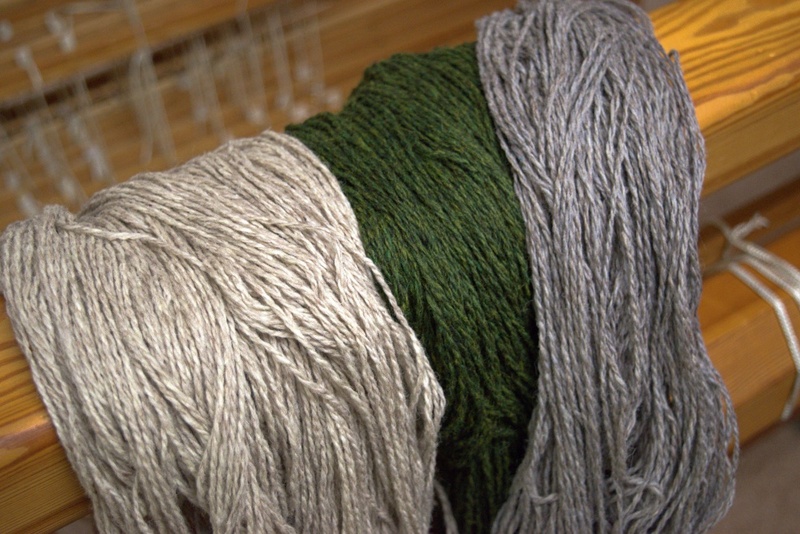 My thrum wool colors may be subtle, but they do contrast with each other and will bloom nicely after fulling to cover the warp. Because the lengths are only about 36”, I will weave the cushion sideways, 18” wide by 30” long, folding it around the seat and hiding the cut ends on the underside. Extra thrums can be used as ties to keep the cushion in place. A path forward feels so good! How do you use up your project leftovers?